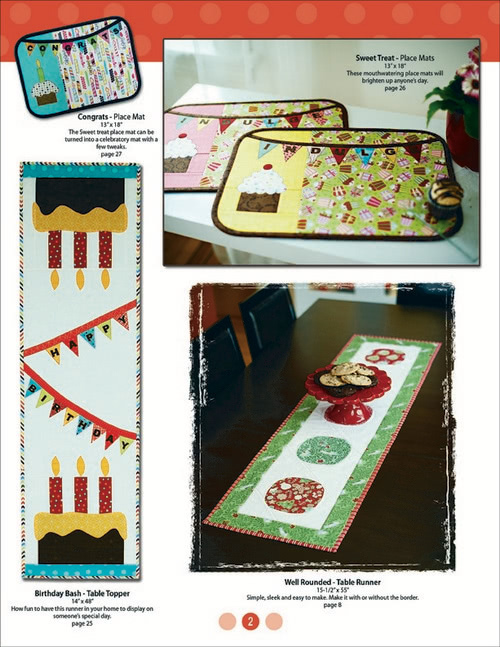 Today is my special day to help Gudrun Erla celebrate 10 years in the United States, the 10th anniversary of her quilt design company, GE Designs and the release of her newest book, Fast & Furious Home. Don’t miss the great give-aways below too. I’ve been trying to remember when I first came across Gudrun’s work, and I can’t remember if I met her at Quilt Market one year or if it was this adorable Sweet Trimmings wall hanging tutorial. 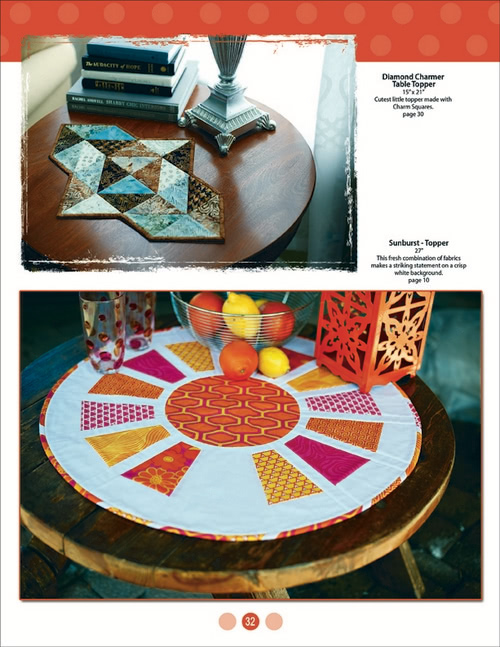 The first on my list to make once my book arrives will be the Diamond Charmer Table Topper. I love the unique shape and the design. I’ll select two winners randomly next Tuesday morning, August 20. 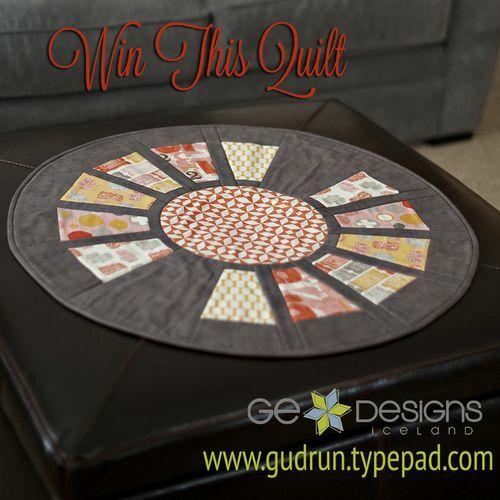 To enter, leave a comment below answering, Have you made any quilts using the quilt-as-you-go method? Be sure to visit all of the sites on the blog tour for more fun, inspiration and give-aways! 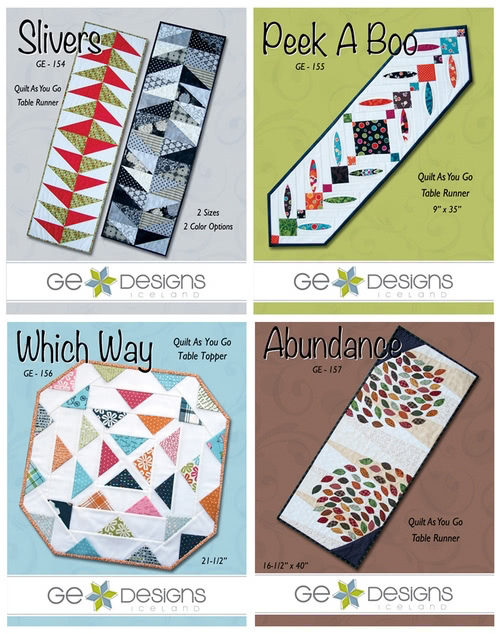 August 14th – Quilting Gallery – You’re here! The two winners have been selected and their email addresses forwarded to Gudrun who will contact the winners directly. Thanks to everyone that entered. Yes i made a Sundrop Designs quilt with a western theme that had Applique i did the Quilt as you go even for the borders. 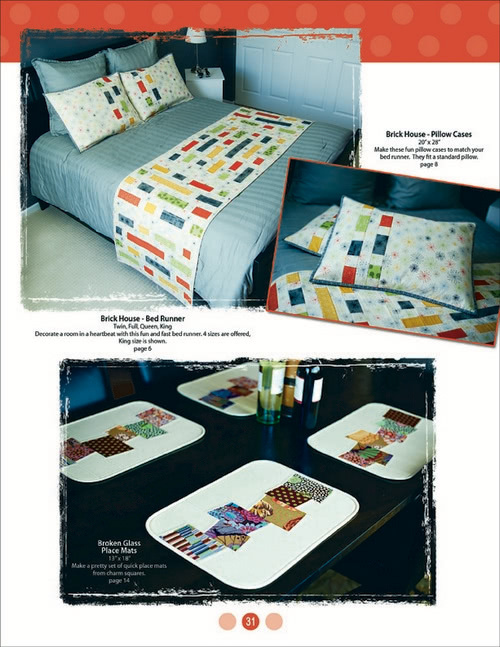 Yes, I’ve made many quilt-as-you-go projects, including a great placemat pattern. I used quilt as you go when I have made Christmas tree skirts, table runners, placemats and baby quilts. I haven’t yet but I’ve been reading about it. So many pretty things to make. Saw some neat bags online and love the patterns in this book. Guess it’s time to make one. No I haven’t made any quilts using the quilt-as-you-go method. I have wanted to and just have not gotten around to it. I’m gonna have to start soon!! I have not made any quilts using that method. I have seen them and it looks easy. Maybe I should consider it for my next one. No I have never tried this method but I’d like to. Thanks so much for the chance to win, I especially love ” Abundance” how divine. 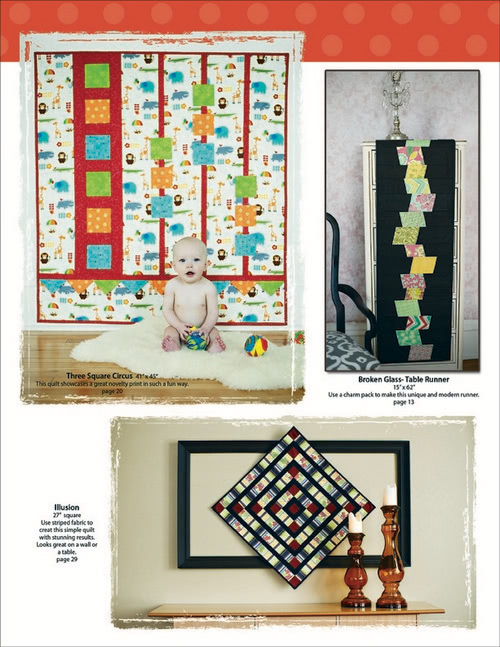 I love quilts as you go! I’ve only used this method for a few small projects but want to make a quilt with it as well. Thanks for the sweet giveaway! I have never done quilt as you go but a guild member showed me a quilt they were making that way and wow was it fantastic. I do want to give it a try. Our Quilt Guild has been making the quilt as you go lap quilts for about 3 years now that we give to the children in our county who are in CPS custody. We have their names put on the quilt and make them a matching pillowcase. We have made over a 100 quilts like this. what a fabulous giveaway – thanks – I haven’t made any quilt as you go but I do have a kit for one that my mum gave me but I can’t seem to get my head around how it works – maybe Gudrun’s book will help me ! I have never done a quilt as you go project but I think I may have to try one. Thanks for the chance to win. I have not done any quilt as you go projects. I have watched videos and looked at a few tutorials, but they all seem to leave something out which I can’t figure out on my own. I haven’t tried this method yet but have just read about it on a friend’s blog and am very tempted to try. Would love some detailed instructions on how it works exactly. Quilt as you go worked great on my first attempt on a baby quilt. Would love to learn more about doing larger quilts but I’m new to quilting and have so many things to learn. Congrats on 10 years! Have not used the Quilt as you go technique yet, but there’s a swap coming up soon where it’ll probably be used and I really wanna be part of that to try it out. I haven’t tried it yet, but I’ve always wanted to try QAYG. 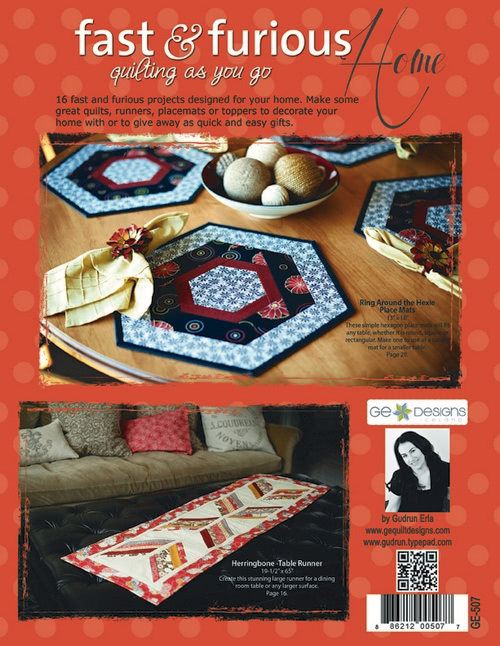 It looks so neat and I love the idea of assembling the quilt and then just being done (or pretty close!). Thanks for the great giveaway! I’ve only done a few small quilt as you go projects. I’d like to tackle a bigger one this year! Yes look hard to find good instruction for a quilt as you go quilt. Made a quilt for my grand daughter, Got quite good at the end. Gudruns book looks very inviting. No, I have not used this method of quilt as you go but sounds good! Would love to win her book. A long tome ago I did a quilt as you go. Might be time to try again. Thank you for the chance. 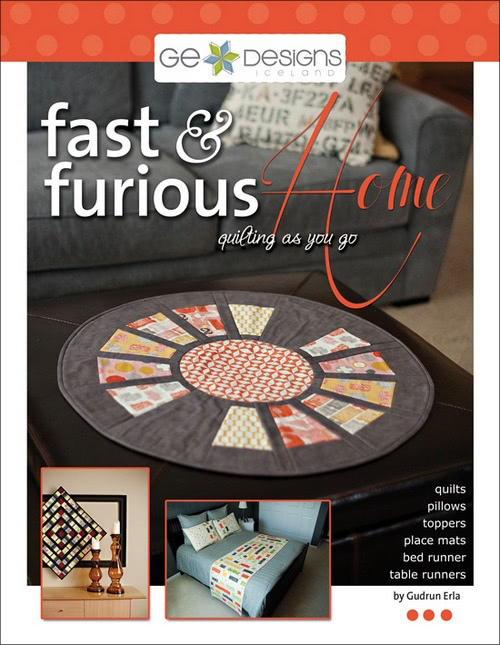 I’ve not tried Quilt As You Go pattern but its on my wish list for my next quilting project. Happy Anniversary to Gudrun. I have made one table runner with the quilt as you go method and want to make more. Her patterns are very pretty and finishing up faster is always a plus. I’ve never used the Quilt as You Go Method – but would love to learn!! I have made a very simple QAYG quilt, just using strips. It was much easier than trying to shove the whole thing in my machine! I have made some of Gudrun’s quilt as you go….shortly after I met that sweet girl when she came to Thief River Falls Minnesota for a quilt college that was put on….she is definitely a favorite of mine. Have you made any quilts using the quilt-as-you-go method? Yes! Some of my very first quilts were made with this method. I only have a couple of the quilts left but they are well-loved. They will likely stick around until there is a grandchild to give them to since they did belong to my son and he didn’t wear out the love, yet. Yes, several years ago, I discovered the quilt as you go method and had the idea to make a log cabin baby quilt of pinks and beiges. I had a new sewing machine that would do little embroidery pictures, so i put little bears in the center blocks. Squares are 18 ” , but being a fairly new quilter, i didn’t know how to join them correctly, so they are my first UFO, still in my sewing room. Maybe Gudrun’s book would help me finally finish it. Thank you for the chance to win. Her work is amazing. I have not done any quilting as you go but have wanted to! 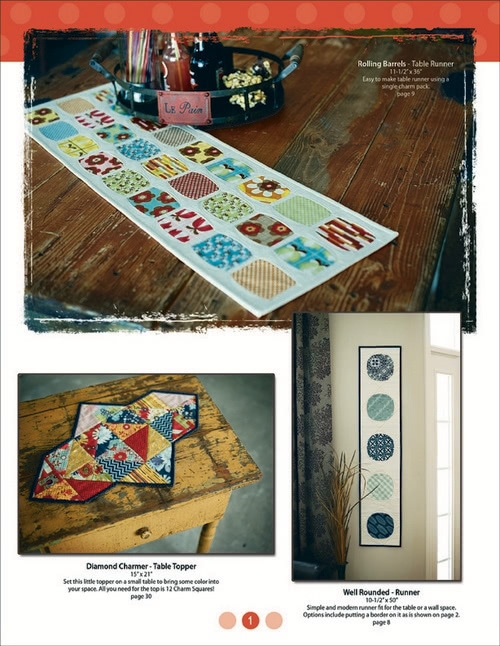 I just bought the Slivers pattern and I LOVE the book – would love to win that. WOW! Love the book and new patterns. I have done one table runner with the quilt as you go method – it was a great way to finish up a project quickly! I’ve made mug rugs using the QAYG method,,,and am making a QAYG bag right now,,,but haven’t tried a full quilt yet. Thanks for the chance to win. I have never made a quilt-as-you-go quilt due to the fact that I don’t quite understand it (the method). Thank you for a chance to win. I did a quilt as you go technique on a table topper, I thought it would be easier & it was not. I need to try one of Gudrens patterns for sure! I have not tried it, but I’ve always wanted to! Thanks! I have not tried the quilt as you go method, but I really do want to. It just kind of makes sense to me. Thanks for this great giveaway! I’ve only made one quilt with the Quilt as you go method. I can’t wait to see the book, looks like some good patterns in there. No quilts but I have made a bag. I haven’t used the quilt as you go before. I have made quite a few quilts for my nieces and nephews making up my own patterns, and have made bags also using my own designs and patterns. 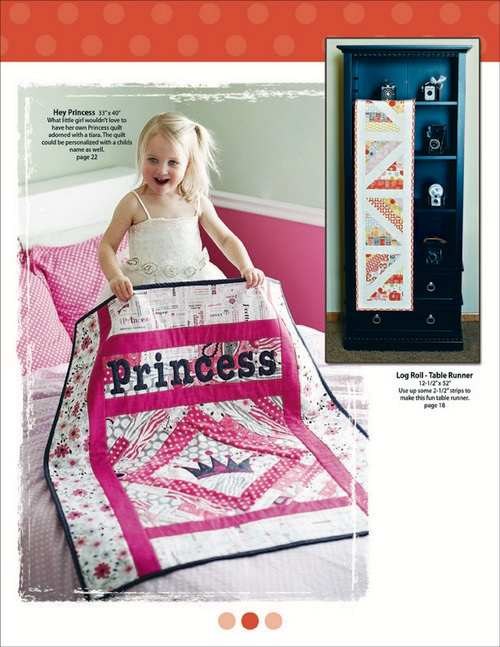 Love quilt books and magazines. I have not as yet done a quilt as you go yet, but would love to try. 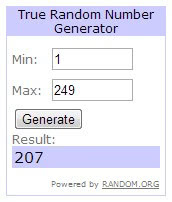 Thanks for a chance to win you lovely give-away! I have not made any quilt as you go yet. This is something that is on my to do list. The first quilt I finished was a techniques Block of the Month quilt as you go… so I learnt lots of different block the bonus of the QAYG method. Yes, I have made several table runners and I love doing it the quilt-as-you-go way. 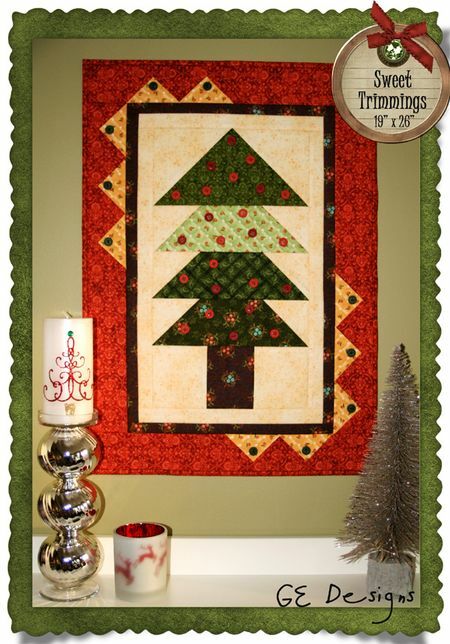 I have in mind to make a Christmas lap quilt just to see if I could do it and then go on to full size quilts. I have been assured that it’s not too hard at all.